It’s easy to get lost in a good book, and maybe lose track of time along with it, or worse not be able to spend as much time reading as you would like. We have a new tool available to help you get your books back on time, or remember to renew. Courtesy notices. A quick email reminder that lets you know you have materials due back soon. 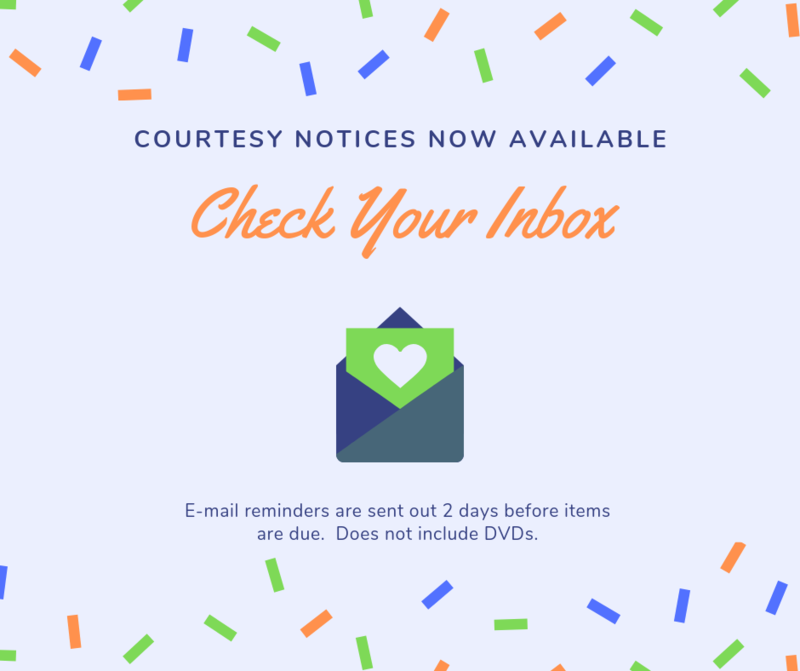 Notices will go out 2 days before the item is due (holidays and unexpected closures may make the time frame shorter). You can use the reminder to return your materials or log into your “My Account” to extend the loan on books, CDs, and audio books (not available for DVDs). Notices are only available for accounts that have email addresses associated with them, not sure if this means you? Give us a call 304-291-7425, or check at the desk next time you’re in.